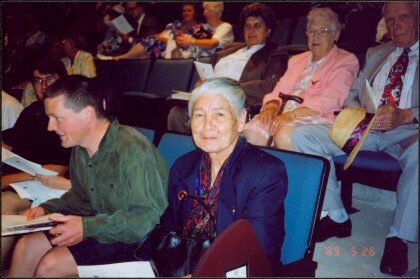 Photograph depicts Mary John sitting next to aisle in Canfor Theatre at the University of Northern British Columbia in Prince George, B.C. Unidentified individuals seated in foreground and background. Accompanying note from Maureen Faulkner: "Mary John takes my seat." Photo taken on the day Bridget received an Honourary Law Degree, before ceremony began. Stamped annotation on recto of photograph: "21+01 NAN-08AU 047".